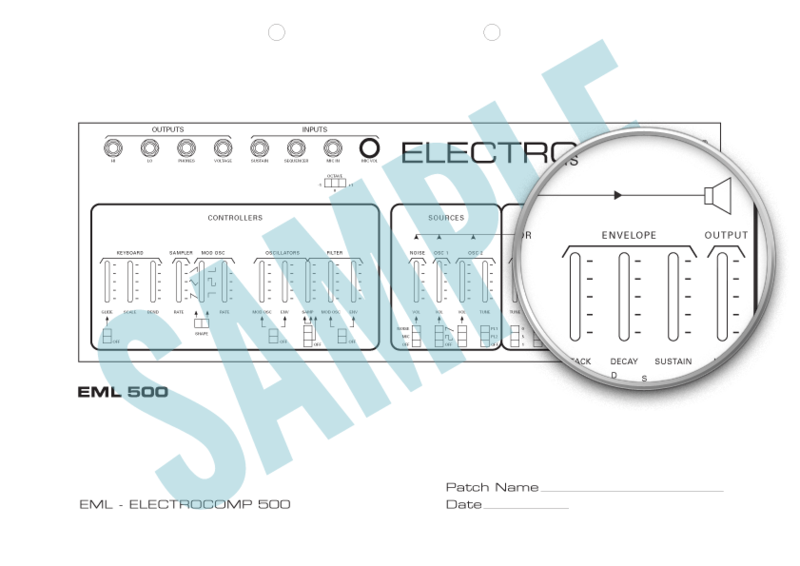 Patch sheets for the original ElectroComp 100 (blue panel), and the later 101. The 101 has two variants I've called "Mark I" and "Mark II". 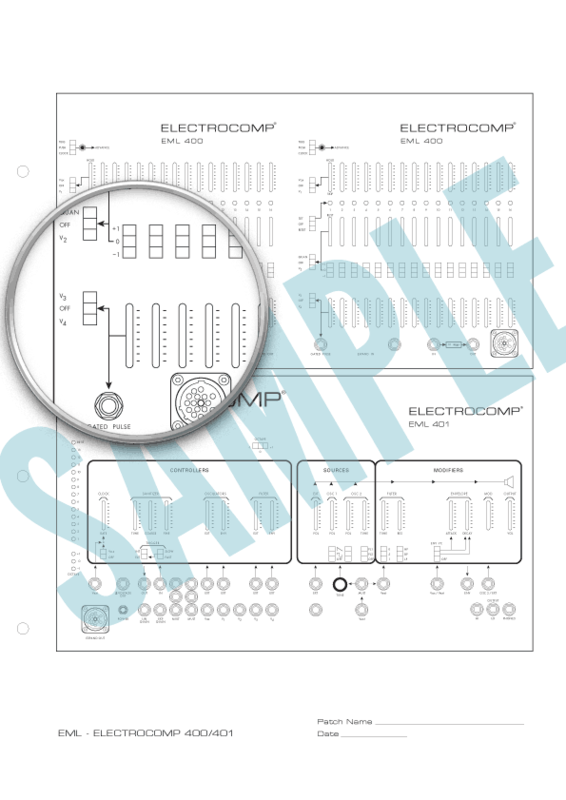 The Mark I has keyboard patch points marked "+ 5 VOLTS" and "CM3", while the Mark II has those same patch points marked as "± VOLTS" and "SEQ". 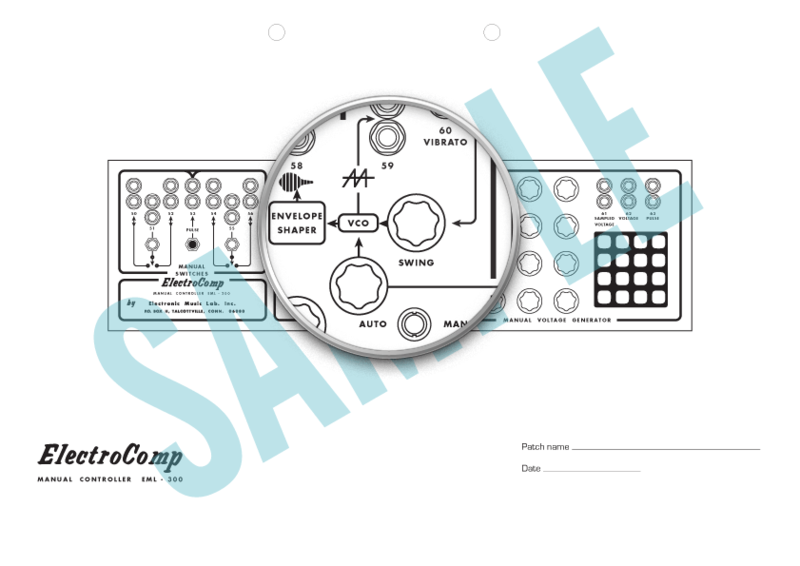 Each patch sheet has ample space for notes and markup of external connections. There were two versions of the ElectroComp 200. Here I've called them the "Mark I (Talcottville)" and "Mark II (Vernon)". The Mark I has a blue face panel, and the Talcottville address on the nameplate. The Mark II had either a blue or silver panel with the Vernon address. The major difference between the two is an additional frequency control and patch point on each oscillator as well as two additional input patch points (No. 35 - Lo/Med/Hi) on the Mic Amp on the MarkII. 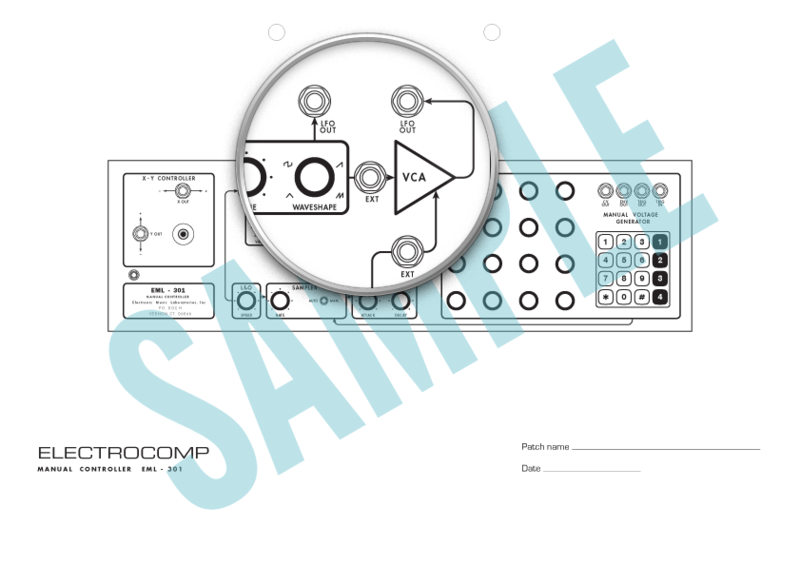 Each patch sheet has ample space for notes and markup of external connections. These funky external control boxes were produced for use with the EML-200 and EML-400, and are here by special request. 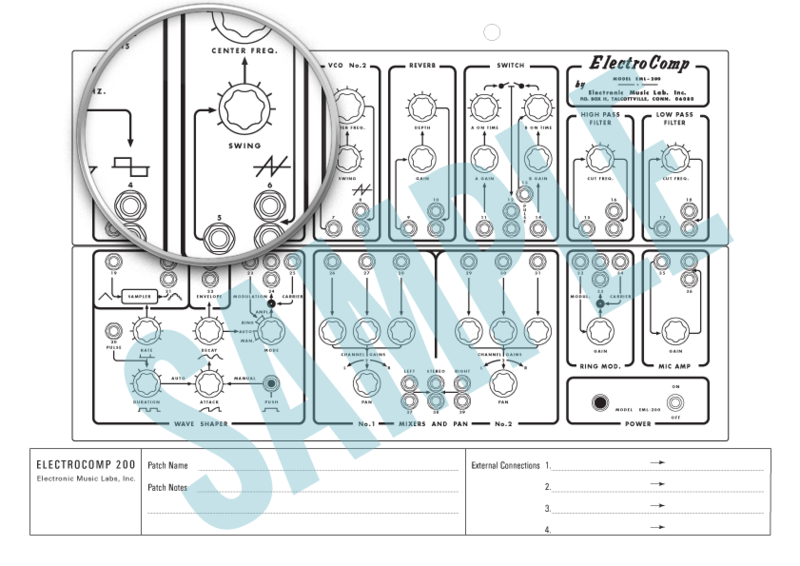 Several versions of the EML-300 were produced, with the main difference being an attenuation pot on the voltage input from the voltage generator section to the VCO in earlier versions (v1 below), which was missing in later versions (v2 below). See the previews to determine which version is right for your box. 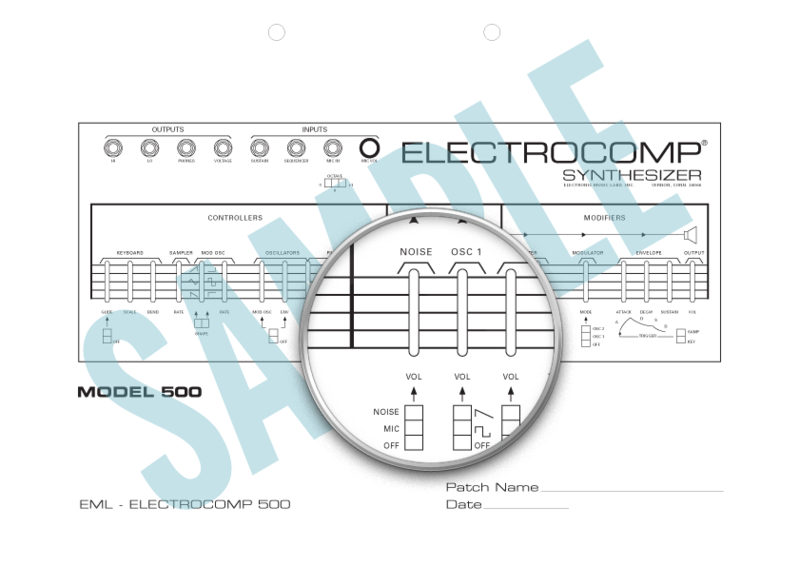 The Electrocomp 400, EML's 16-stage sequencer, came in several possible configurations. The 400 itself comprised a single half-panel voltage stage output and a single half-panel controller. 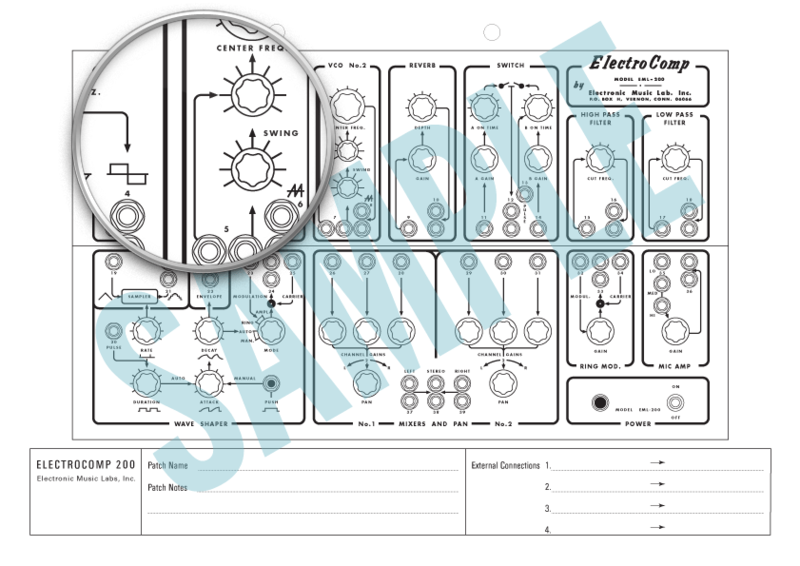 The 401 was a half-panel, single-oscillator synthesizer almost identical to the right half of the EML 500. In addition, a half-panel 16 stage expander for the 400, the 416, was also available. These were sold either in separate half-panel cabinets, or in a dual full panel cabinet that opened on a hinge to reveal the 32 cv stage panels on the left and the controller/synth on the right. Here I provide the most common configuration, the full compliment 400 + 401 (with 416 expander). If you require any other configuration please get in touch. I'd be happy to put together something to match your system. 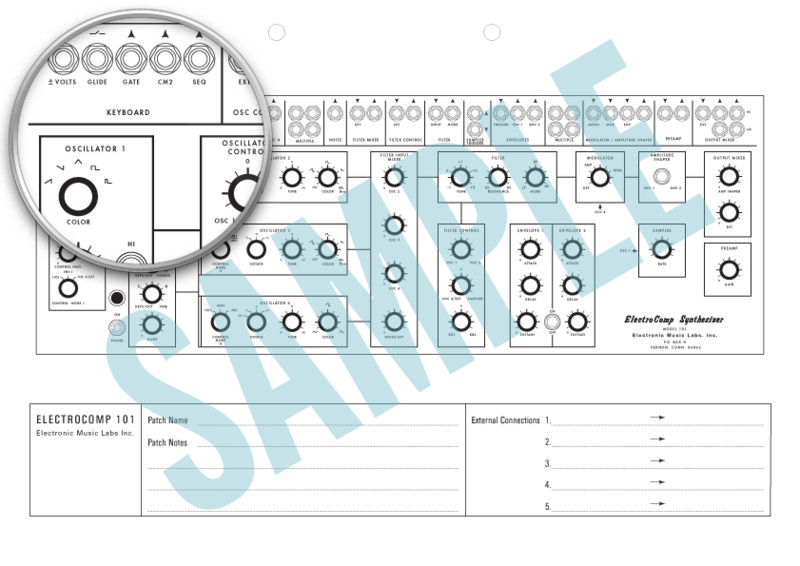 NB: This patch sheet is a large, A3 format. EML's quirky 'performance' synth from 1973-1984. 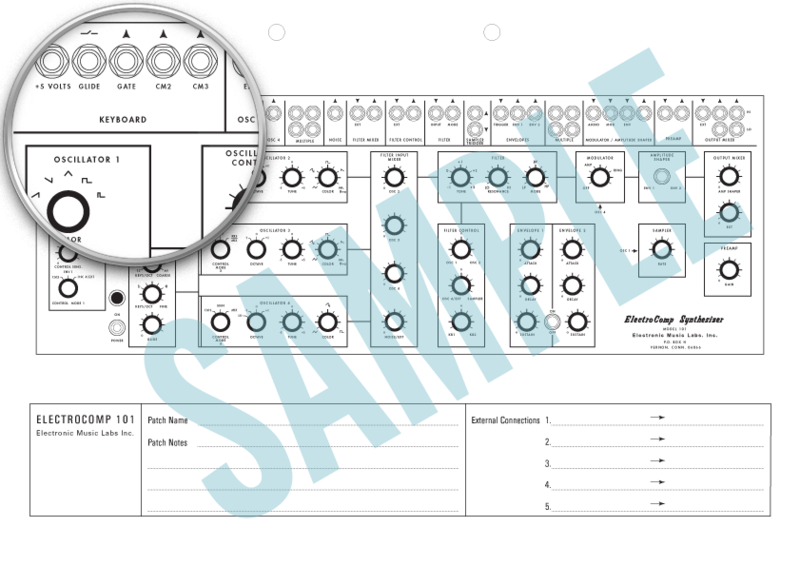 The most common version (here labelled "version 2") matches the layout of the EML 400/401's right panel. A much rarer version with a different panel markup but identical functionality was also available (here "version 1"). 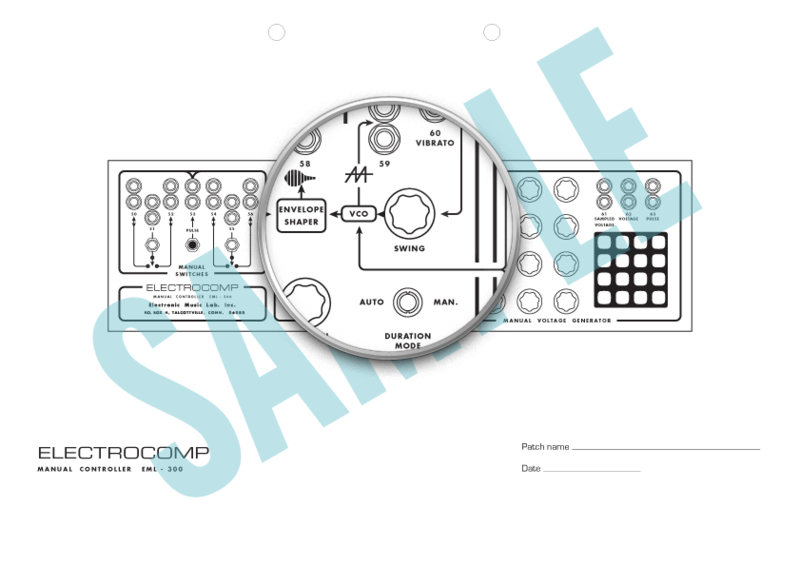 Both are available below for you to find a patch sheet matched to your instrument. Now, whip it! 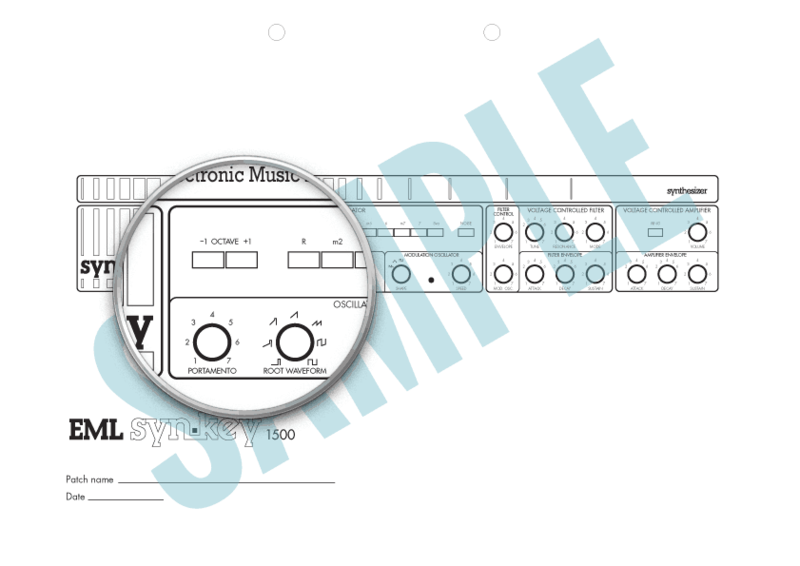 Released originally in 1976 and one of the first programmable synthesizers around, the EML Synkey is today a rarity. 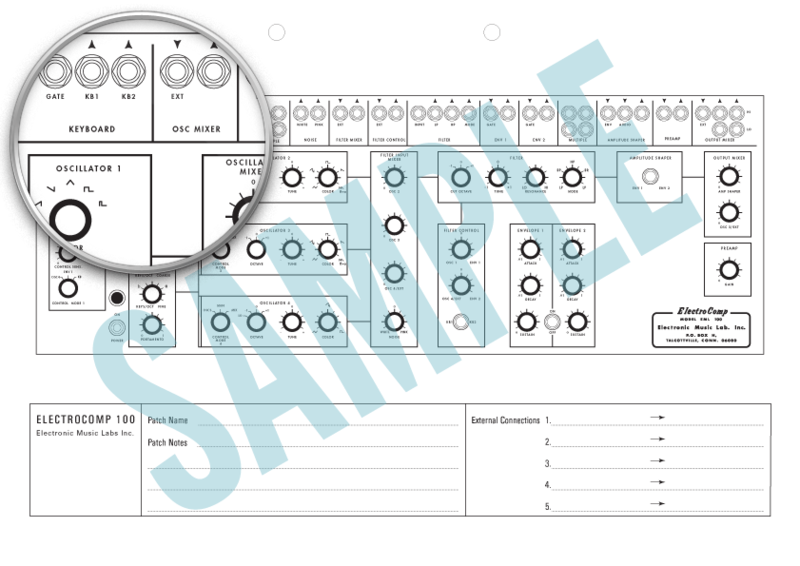 Below are patch sheets for both the programmable (model 2001) and non-programmable (model 1500) versions. 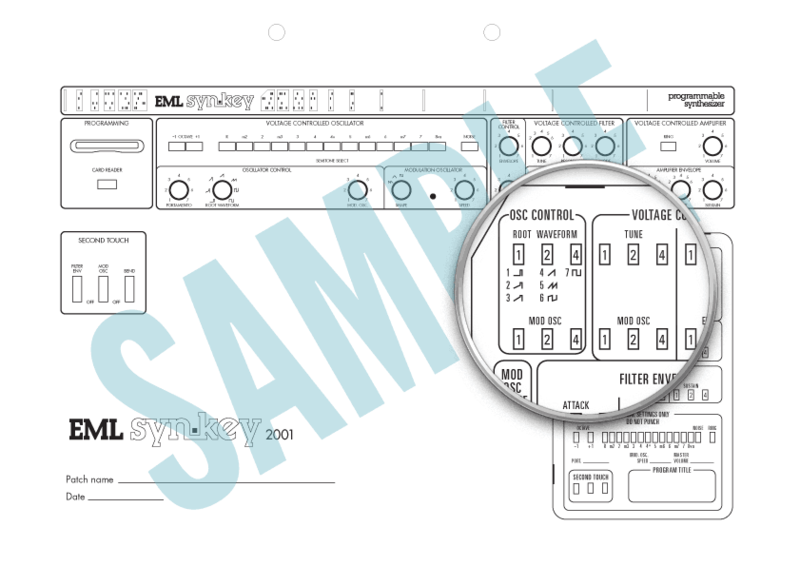 The Model 2001 patch sheet contains a representation of the original programming card so you may record your patches in one of two ways. Note that not all parameters were in fact programmable. That pretty much covers EML's entire range of synths. If you're looking for something specific you don't see here, drop me an email and I may be able to deliver it for you.